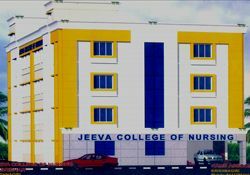 Jeeva School of Nursing was started in the year 2007-2008. The purpose of starting nursing programme in the Krishnagiri district is to render qualified scientific knowledge and to uplift the socio-economic status of the most backward district of Tamilnadu. Sree Pankajam Krishnan Educational Trust, under Board of Examination for General Nursing and Midwifery, Recognized by Tamilnadu Nurses and Midwives Council and Indian Nursing Council.